C. Canadensis is native from southern Greenland to Alaska, south to Maryland, west to South Dakota, New Mexico, and California. 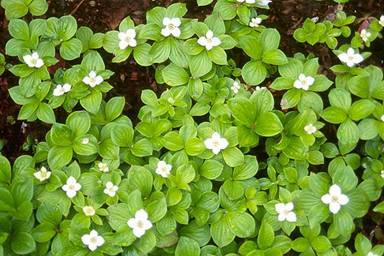 C. unalaschkensis is found in Northwest North America and Northeast Asia, south in mountains. Southern limit of range may be due to its preference for cool, acidic soils and its inability to survive in summer soils warmer than 65º F.
Very common in shady, moist forested wetlands in Pacific northwest. Plants sold as simply Cornus canadensis (without the label “var. intermedia”) are often from the East Coast and are not native to the Pacific Northwest. Moist coniferous forests; bogs; grows on stumps and logs in maritime forests; Growth most vigorous in partial shade; Moist, well drained sites preferred. It is considered a facultative wetland plant. C. unalaschkensis  is a clonal perennial that relies heavily on vegetative regeneration to maintain itself and spread. Responds vigorously to disturbance; C. unalaschkensis had sprouted from rhizomes in previously clearcut areas, blowdown, and scorched sites. Montane Coniferous Wetlands; Montane Mixed Conifer Forest ;Cornus-Linnaea synusia. Division most successful method, but can be collected by seed. Salvage must be done while leaves are still on so you can see them; collect seeds August to October, as soon as the fruit are ripe. If seeds are sown right away, you don’t need to remove the flesh. Some seeds may not germinate until the second spring, or possibly the third spring; need cold stratification. Seedlings grown from seed have a greater chance of survival, but division is the most successful method. Prefers acid soils (pH 3.0 to 7.9) that are somewhat damp most of the year. Cannot survive in summer soils warmer than 65º F.
Division most successful method; most regeneration is by rhizome. Low fruit set, low germination and survival rates, and slow early growth limit reproduction by seed. Requires frequent watering until well established. · Leigh, M. 1999. Grow You Own Native Landscape. Native Plant Salvage Project ; WSU Cooperative Extension—Thurston County. · Pojar, J. and A. MacKinnon. 1994. Plants of the Pacific Northwest Coast Washington, Oregon British Columbia & Alaska. BC Ministry of Forests and Lone Pine Publishing, Vancouver, British Columbia, Canada 527 p.
Data compiled by Mike Cooksey, 5 May 2003.